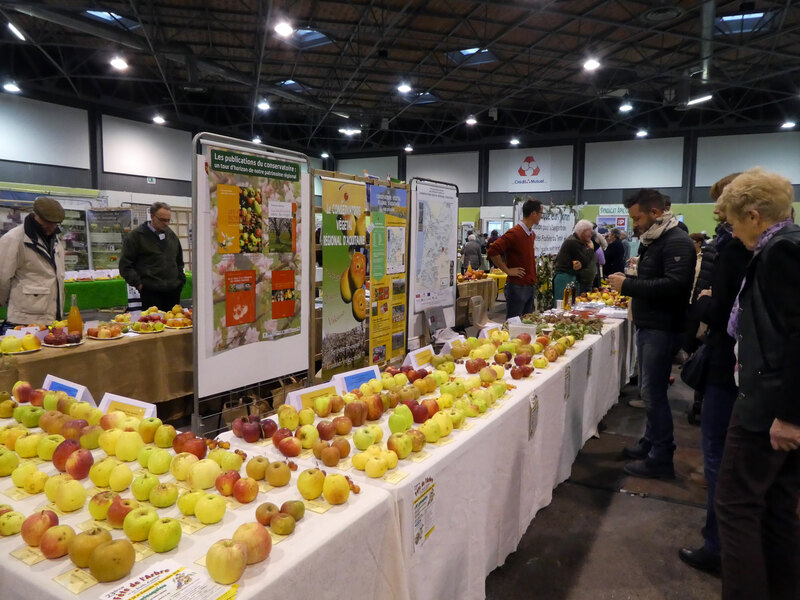 At Europom 2018, on Saturday 27 and Sunday 28 October, 400 exhibitors presented 2,000 cultivars of apples, pears and other fruit of traditional and local varieties that grow in Europe. 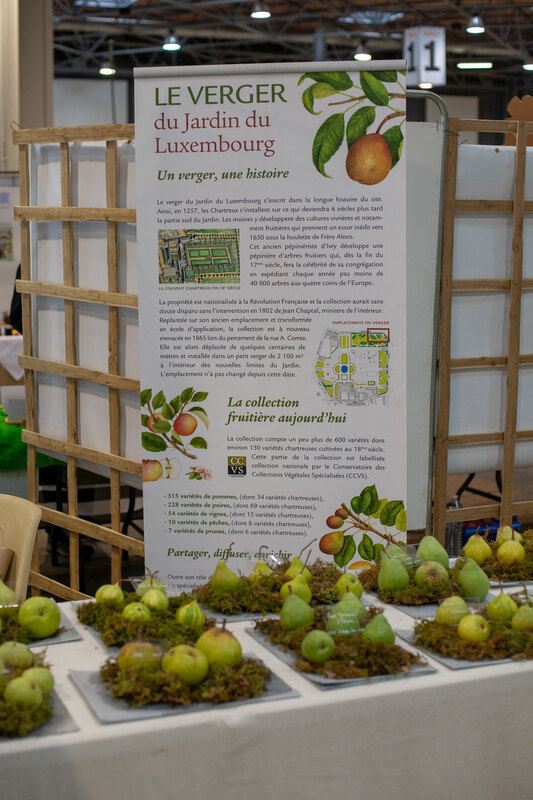 The fruit was displayed on 120 stalls in a 4,500 square metre exhibition hall in the city of Troyes, the historic capital of the Champagne region1. 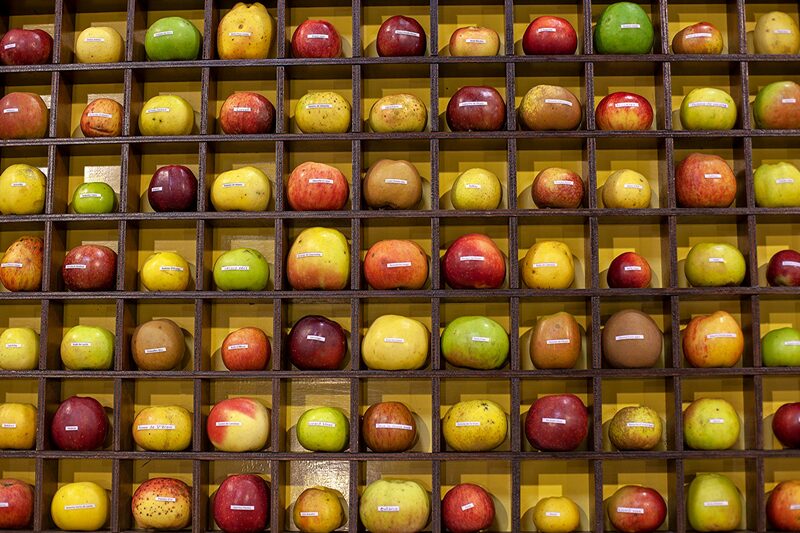 Eighty stalls like this one, at least six meters wide, presented fruit, including twelve held by organisations from foreign countries. 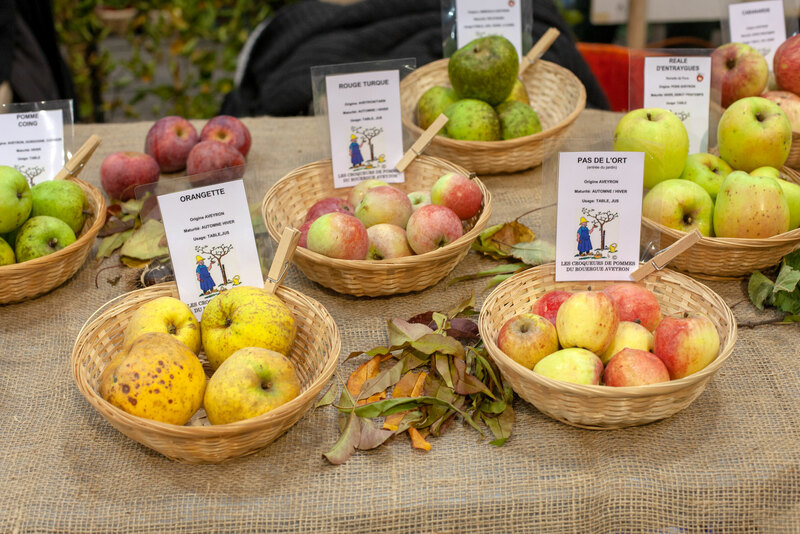 Forty additional stalls were held by other organisations, most of which had a connection with the growth and use of local fruit. The stage was set for a colourful event. Photo 27 October, Troyes exhibition centre, France. 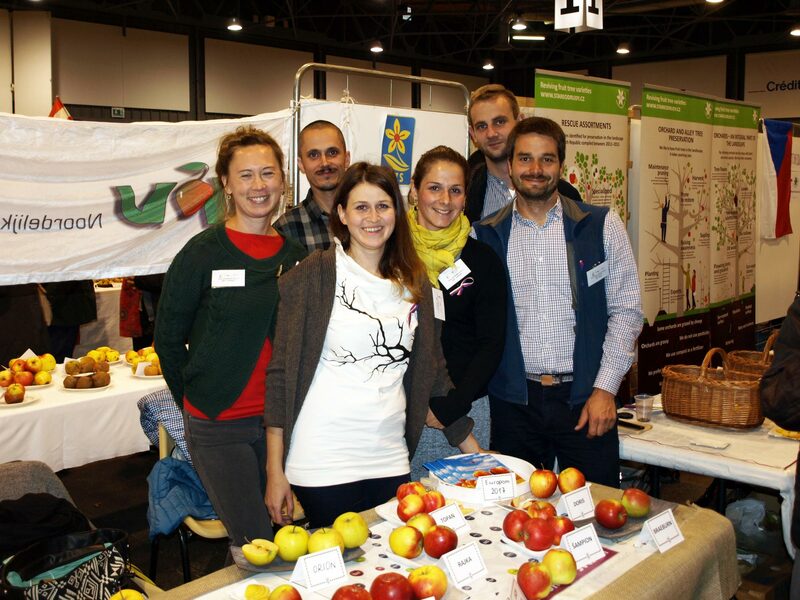 Europom is a consortium composed of ‘mainly volunteer associations which are active in pomology and the conservation of traditional and local fruit varieties’2. The primary aim of the annual Europom exhibitions is to enable its members and other organisations with the same vision to meet and share knowledge and good practice. 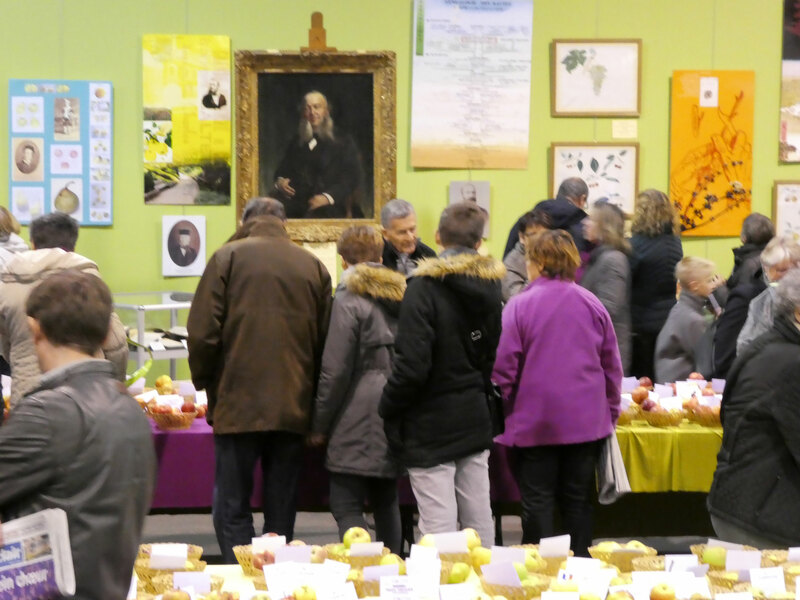 The exhibition is organised once every five years in France by Les Croqueurs de pommes, one of the consortium’s founders. ‘At the same time it is a good promotion of the old and local varieties to the general public’, the consortium claims. Some 6,000 external visitors came to Europom 2018, as reported by a local TV channel in a two-minute video (in French). This year, the French national movement of volunteers, who ‘safeguard the local fruit gene pools’3, celebrates forty years of existence. 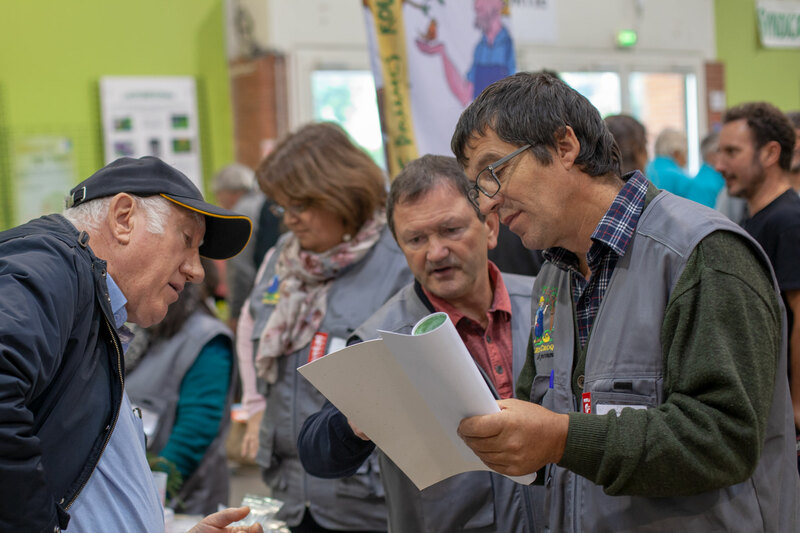 Les Croqueurs de pommes, which started in 1978 near Montbéliard in the North East of the country, have since spread over two-thirds of the French territory with sixty-three local associations and more than 8,000 active members. ‘This number does not include thousands of people who have been introduced to arboricultural techniques and stimulated to participate to the restoration of our common fruit heritage by the action of the association’. Jean-Louis Choisel, the founder of the movement, was a visionary. He committed to a cause that little by little gains momentum across Europe, as more and more people become aware of the threats to biodiversity generated by human activity. The French association, which self-finances its activities, continues to grow. Europom 2018 was coordinated by Les Croqueurs de pommes d’Aube-Champagne-Pays d’Othe4 in collaboration with the national association. 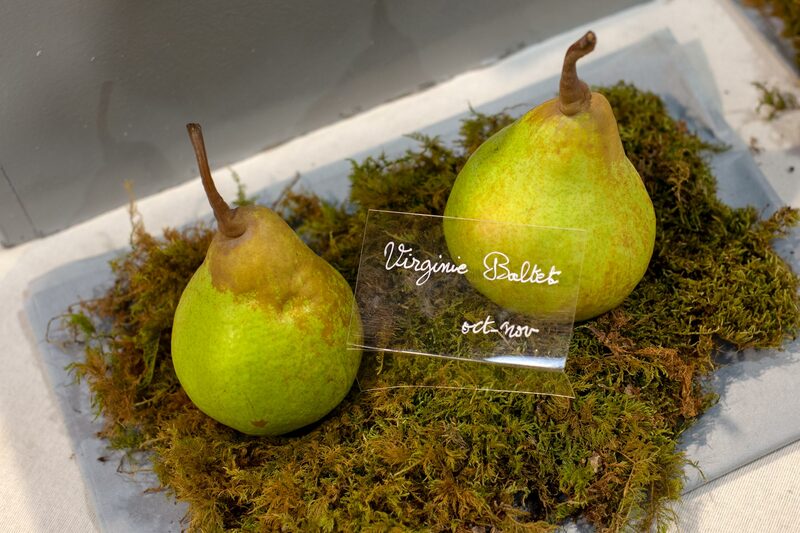 It was also an opportunity for them to celebrate Troyes’ famous figure of nineteenth century horticulture, Charles Baltet5, who for instance created the Guyot pear. Charles Baltet was present on several stalls at Europom 2018. We can see his portrait here on the Aube-Champagne-Pays d’Othe stall. Photo Marc Petitprez, Troyes, 27/28 October 2018. Ten countries were present: the Czech Republic (Europom 2017’s organiser), Germany, Austria, Switzerland, France, Luxembourg, Belgium, the United Kingdom, the Netherlands and Sweden. The two teams of the Czech Republic. Photo published with David Svoboda’s kind permission. 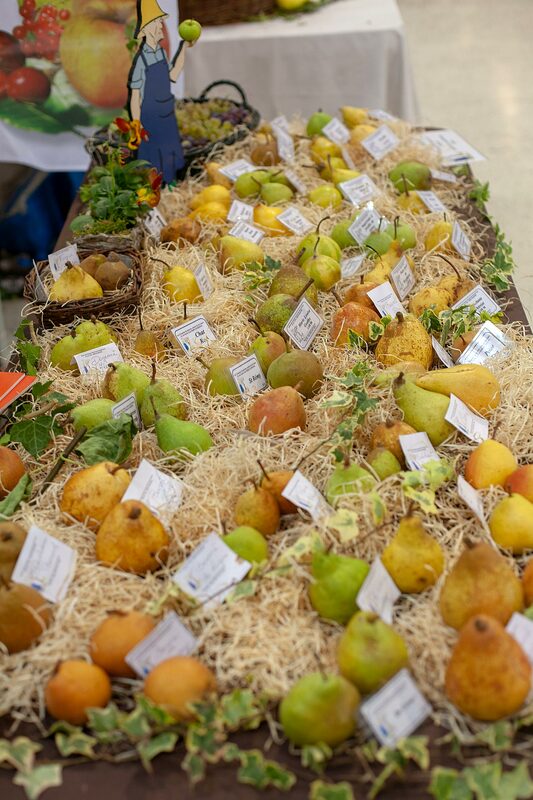 The Conservatoire Végétal Régional d’Aquitaine6 and the Verger du Jardin du Luxembourg7 in Paris were among the other stalls where fruit was displayed by organisations independent from Les Croqueurs de pommes. 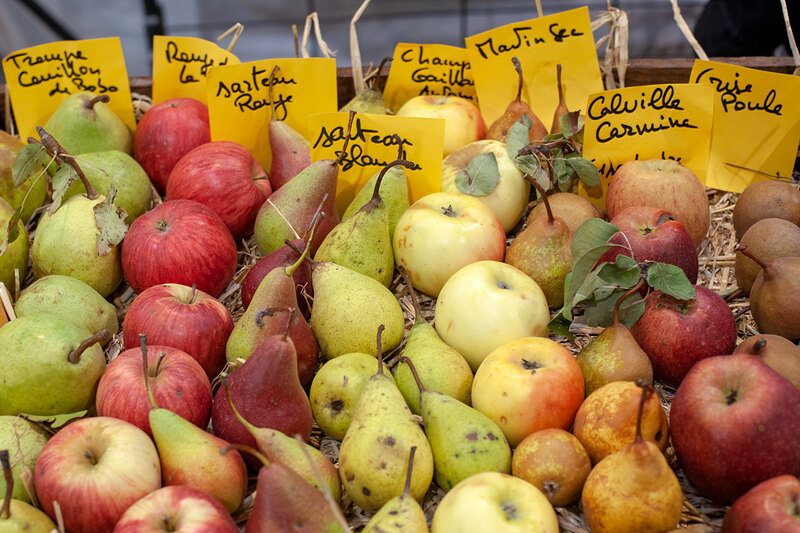 The Conservatoire Végétal Régional d’Aquitaine was founded 35 years ago by Evelyne Leterme, another prominent figure of the conservation of heritage fruit varieties. It covers the South West of France where Les Croqueurs de pommes are less present. Photo Marc Petitprez. Le verger du Jardin du Luxembourg, part of the park of the same name in Central Paris, hosts in particular the French national collection of fruit trees cultivated by Carthusian monks during the 18th century. Photo 27 October. A tribute to Charles Baltet on the Verger du Jardin du Luxembourg stall? Photo 28 October. I was not involved in the preparation of Europom 2018, but contributed on site by making sure the foreign delegations had everything they needed. I also participated to the set-up and animation of the Croqueurs de pommes du Cantal’s stall, the local association I belong to. I drafted this article on my way back to Paris after the event. In contrast with my trip from Olomouc to Prague after Europom 2017 last October, there was no public Wifi access on the train. As a consequence, I couldn’t search the Internet for references to support my writing. I couldn’t process my pictures either, as I needed access to the Cloud to do so. This made me think about the modernity of my country, and the way we cater for the needs of others. With regard to languages for instance, most of the information available at the event was in French, with no translation in English. How did our international visitors feel? Actually, many foreign delegations came to me at the end of the weekend to express their satisfaction, saying how impressed they were with the scale of the event, how much they enjoyed the experience and learnt from the various people they met. This display of sheer positivity came as a slight surprise to me. I didn’t feel we fully deserved it: I perceived Europom 2018 as mainly organised by the French for the French, so how could our foreign peers be so enthusiastic? Upon reflection, I think I understand. I can still hear the voices and see the sparkle in the eyes of those who went from stall to stall to share their passion for fruit and of those who welcomed them on their stalls and shared with them the best of their regions and countries. Serious talks took place, but not only. 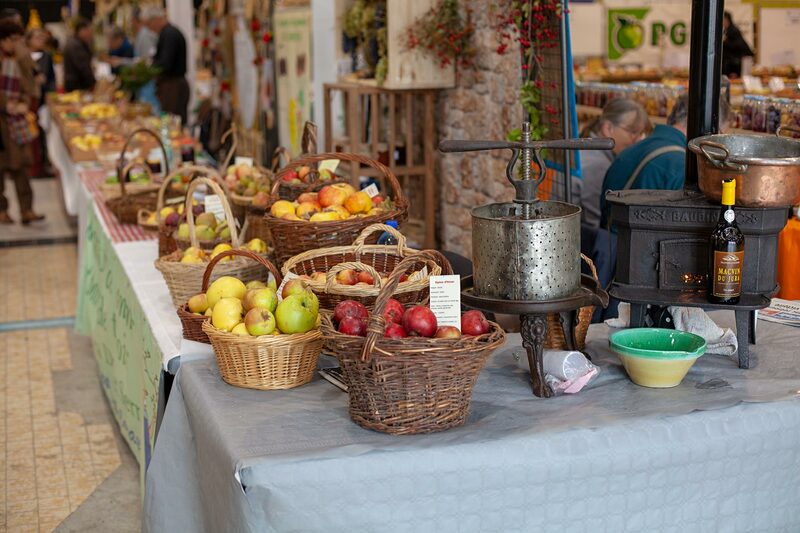 For instance, many exhibitors invited their peers to stop by their stall to celebrate Europom 2018, offering to taste local produce, from apple juice heated on site with honey and nutmeg to Roquefort cheese and champagne. I didn’t capture those most cheerful moments on photo, but they happened all over the place. Photo 27 October. 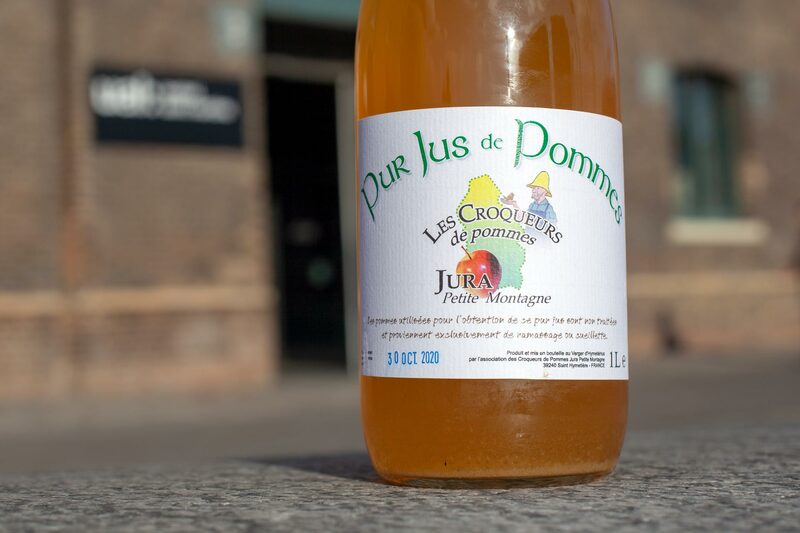 A bottle of the apple juice I tasted on Les Croqueurs de pommes Jura – Petite Montagne stall. I will remember the nutmeg tip. Photo 31 October, London, UK. 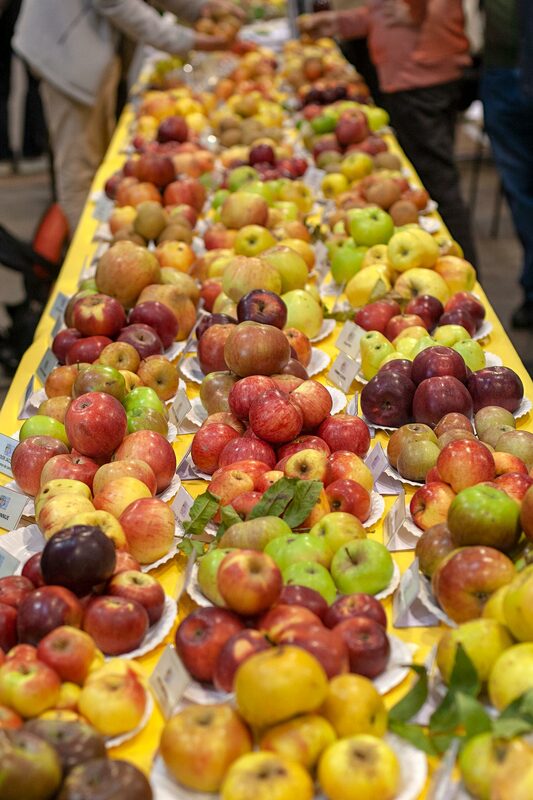 At Europom 2018, fruit took centre stage. However, it was also a pretext for a broader celebration of regional cultures and how we enjoy life in our various localities, and everyone was invited to join in. It was a cheerful event, one of those that warms the heart for a long time. Europom 2019 will take place on 19 and 20 October at the beautiful castle of Alden Biesen8 in Belgium. The exhibition will be organised by Nationale Boomgaarden Stichting9, one of Les Croqueurs de pommes fellow founders of Europom. There is no doubt it will provide lots of other moments of rich human interactions and constructive exchanges about fruit. 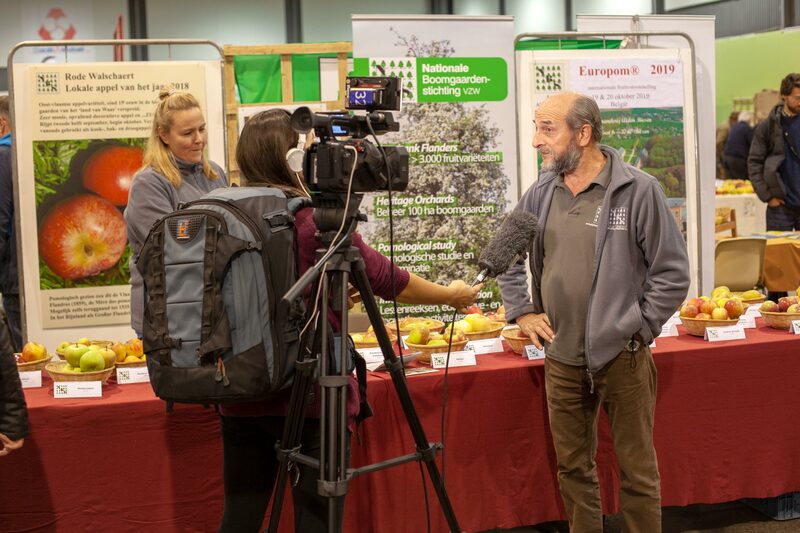 The chairman of the Belgian organisation Nationale Boomgaarden Stichting, organiser of Europom 2019, interviewed at Europom 2018. Photo 28 October. https://www.champagne-ardenne-tourism.co.uk/discover/weekend-town/troyes (accessed 9 November 2018). Europom’s aims: see the ‘Belgium’ chapter of our 26 October 2017 article: https://lesjardinsdici.com/2017/10/26/europom-2017/. https://croqueurs-national.fr/en/ (accessed 9 November 2018). https://croqueurs-national.fr/associations-locales/3-aube-champagne-charles-baltet.html (in French, accessed 9 November 2018). A book written by a former chairman of Les Croqueurs de pommes on Charles Baltet: http://www.maisonduboulanger.com/nos-editions/charles-baltet.html (in French, accessed 9 November 2018). https://www.conservatoirevegetal.com/?pg=english (accessed 9 november 2018). Verger du Jardin du Luxembourg, Paris: see our 31 May 2018 article: https://lesjardinsdici.com/2018/05/31/the-return-of-the-monks-famous-apples-and-pears/. https://www.alden-biesen.be/en (accessed 10 November 2018). http://www.boomgaardenstichting.be/index.html (accessed 10 November 2018). This entry was posted in Events, Stories and tagged CroqueursDePommes, France, Troyes by Les Jardins d'ici. Bookmark the permalink.